Is It Your Year for a New Yard? 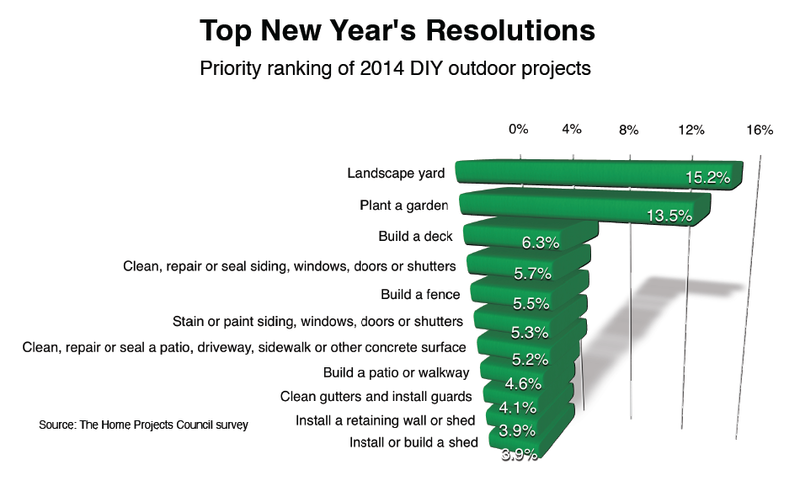 The start of a new year always brings a bevy of resolutions – and according to the Home Projects Council, a top priority among do-it-yourself homeowners in 2014 is landscaping their front or backyard. What’s Your Retaining Wall Style? Be sure to let us know on our Facebook page or in the comments section below which landscaping project you have planned for 2014! Can the inspiration you need for a landscaped paradise outside be found online? The Internet has become a first stop for homeowners searching for ideas to improve their landscapes with sites like YouTube that make it easy to visualize results. You can enjoy a short video from Anchor Block Company on You Tube that shows the complete installation of a paving system. Viewing the demolition is an exciting glimpse into the day in the life of a professional landscape contractor. And seeing the results will inspire you to take a peek outside at your own driveway or backyard and visualize what could be. Your own green thumb is a useful tool, so click away and find inspiration! Whatever inspiration you find to make your landscape dreams come true, click over to Facebook and tell us what you found. Improving your outdoor space has many benefits. Besides the enjoyment you’ll personally receive from a well-designed landscape with quality products, you can also improve the environment by adding sustainable plants and products that can increase the financial value of your home. If you look at your property and have some ideas but don’t know where to begin, it’s time to contact a professional contractor. Landscape contracting companies range in size from small, where the owner might also be the salesperson and installer, to large-sized companies, which might include a design service, multiple installation crews and a maintenance division. You should define the scope of your project, which includes your budget, the boundaries of where the improvements will take place and your timeline. Make sure the scope has input and agreement from other occupants in the household, too. Establishing the scope early and sticking to it will keep you on budget and will also help expedite the process. Referrals are a reliable way to locate a landscape contractor, so ask friends, neighbors and relatives whose yard you admire to recommend a contractor. If you don’t have a referral, look to a state association for nurseries and landscape professionals such as the Minnesota Nursery and Landscape Association (MNLA). You can search the MNLA website for the name of a contractor who is a member. The MNLA website also lists hardscape supply centers which are businesses that sell products and supplies to contractors. Find a location to visit and ask the counter sales people for a list of recommended contractors. Interview several companies and provide each company with the same project parameters so you can equally evaluate their design, plan and budget. Ask for referrals. A quality company will have names readily available. Call former clients and ask about the quality of work and whether the contractor worked within the agreed upon timeline and budget. Request a written estimate that details the plan or design, the materials to be used, the timeline and cost. Improving your outdoor space will bring years of enjoyment as well as the satisfaction of knowing that your investment should pay off in higher property values. So go ahead and turn your dreams into reality with the help of a professional landscape contractor.